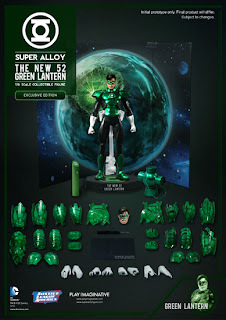 Beware my power, Green Lantern's light!!!" Well, I liked the above oath out of so many Green Lanterns' oaths. 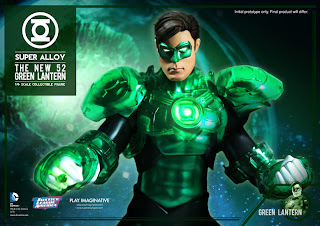 Anyway, I was kind of disappointing when Hot Toys did not came out with Green Lantern from the Green Lantern movie. 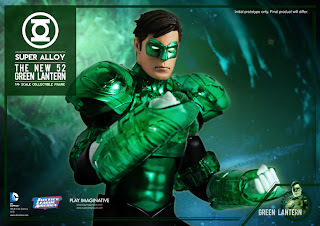 Play Imaginative announced the Super Alloy Green Lantern some time ago and I have been waiting to see the actual product. Recently saw picture of this showing up in the internet and went straight to their official website to find out more. 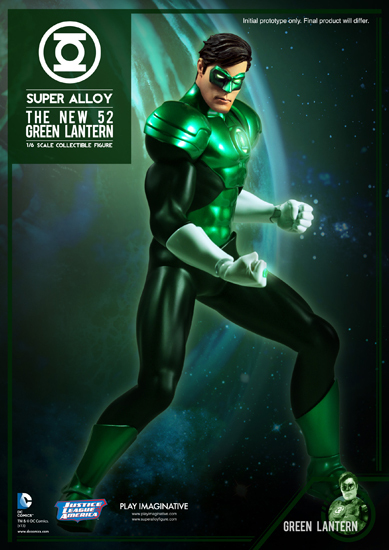 Seriously I think it look much better then the Super Alloy Superman, which I also posted it earlier here. But it is still not up to the expectation I wanted... Well if you are interested in this, hurry go over to the website to make a preorder! Hope I can see this in STGCC! Developed based on computer 3D model from DC Comics, ensuring accuracy of proportions. More than 80% die-cast material. Showroom glossy metallic paints, matte metallic paints and polished metal with protective coating. 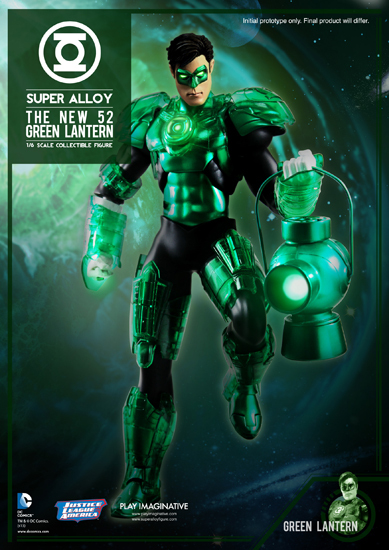 One (1) interchangeable head of The New 52 Green Lantern. Each head sculpt is individually hand-painted, with authentic, detailed and comic accurate facial features. 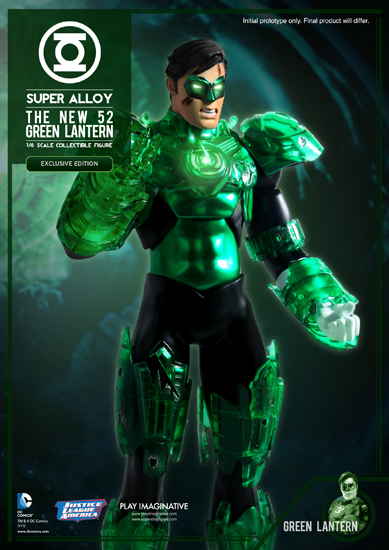 Die-cast metal torso, forearms, calves, and boots. Rubber exterior with die-cast metal interior ribcage, biceps, and thighs. Figurine with more than 25 points of articulation. Double jointed neck. Ball jointed shoulders for full range of arm movements. Ball jointed wrists and groin. Double jointed body, bendable at upper torso. Ball jointed ankles with bendable boot front. One (1) pair of relaxed hands. One (1) pair of flying pose hands. One (1) pair of semi-clenched hands. One (1) pointing hand and One (1) lantern-holding hand. LED lights in eyes and chest emblem (batteries included, controlled by remote). LED light in ring on fist only (batteries included, not controlled by remote). Die-cast remote control to control LED lights in figurine only (batteries included). Lantern with LED lights (batteries included, not controlled by remote). 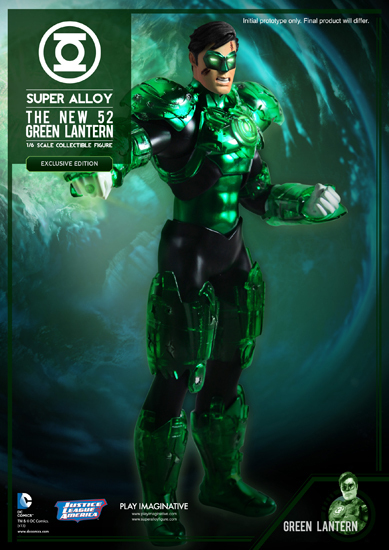 Transparent green full body armour construct with weapon. Base stand with claw comes with adjustable height. Foldable backdrop with plastic angle supports to enhance display of figurine. Hard case box with metal plate logo. Microfibre cleaning cloth for cleaning off fingerprint marks on alloy parts. Screwdriver for opening battery compartments. Tests performed - Oxidation, paint chipping, paint fading, electronic and battery tests. i will be there on sat n sun...see u there.. Yes, me too. Will be gg there again in the afternoon.